The Parker Solar Probe hasn’t touched the Sun yet, but it’s well on its way. On Monday, just 78 days after its launch, NASA’s spacecraft broke the record for the closest approach to the Sun by a human-made object. At around 1:04 p.m. EDT, it was just 42.73 million kilometers (26.55 million miles) away from the star, crossing the threshold set by the German-American Helios 2 probe in April of 1976. According to NASA officials, distance to the Sun wasn’t the only record Parker broke Monday — it also set a new record for fastest speed relative to the Sun. The previous record was 246,960 kmh (153,454 mph), and it was set by — you guessed it — Helios 2. 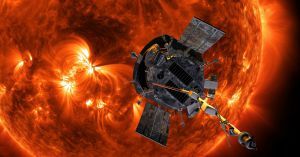 The Parker Solar Probe will continue to set new records repeatedly as it continues its trek toward the Sun. If all goes according to plan, by the time Parker runs out of fuel, it will have completed 24 close flybys of the Sun, with the last putting the craft within just 6.16 million kilometers (3.83 million miles) of the star’s surface in 2025. That close encounter with the Sun’s gravity should help Parker reach a top speed of roughly 690,000 kmh (430,000 mph) — at that speed, you’d need just one second to travel from Philadelphia to Washington, D.C.
It’s not hard to imagine another 40 years passing before we see a craft break that record.